The Favela Brass Project: Thank you John Escreet! 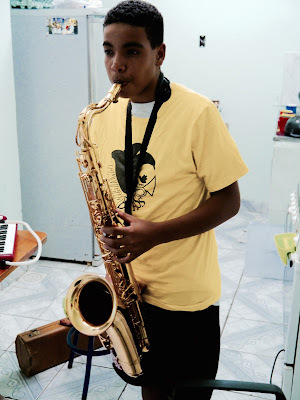 Here is star student Vinícius playing the Yamaha tenor saxophone kindly donated to the project by jazz pianist and composer John Escreet (originally from the UK, now based in New York). Vinícius is absolutely thrilled to bits with the instrument and has really taken to it - the video was taken after he managed to pick up "When the Saints" in his first lesson. Well done Vinícius and thank you ever so much John Escreet!